Acute heat toxin dysentery or gastroenteritis causing diarrhea with pus, pain and abdominal cramping. Also for diarrhea and cramping due to food poisoning, bacteria, fungus and protozoa, travelers' diarrhea are some of the imbalances satisfied clients have used this product for. 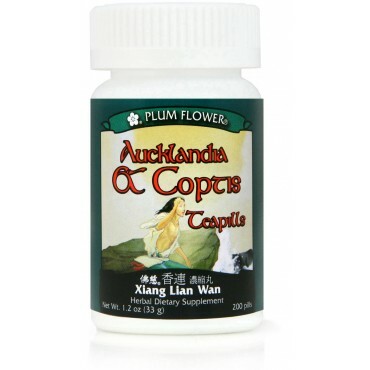 Coptis chinensis rhizome, Aucklandia lappa root. - Huang lian, Mu xiang. Use with caution in Spleen deficient individuals with a tendency to loose stools, diarrhea, poor appetite or chronic digestive weakness.